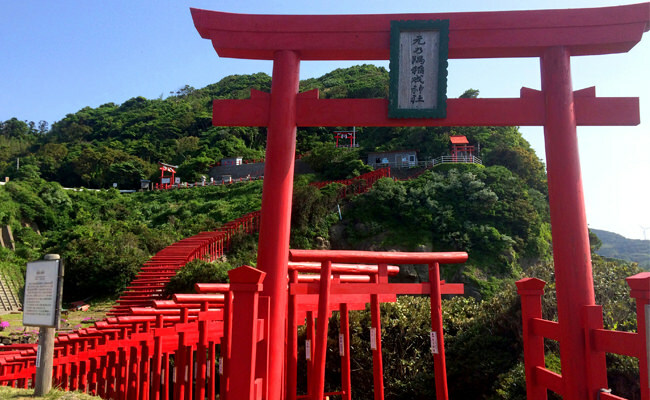 Today we’d like to introduce you to some places to visit along with Motonosumi Inari Shrine, including some Nagato spots that are perfect for taking photos. What are the Yuya Terraced Rice Fields? Facing to the east, the Yuya Terraced Rice Fields present a beautiful rural landscape. 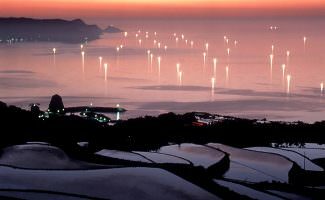 The terraced rice fields here were selected as a part of the Ministry of Agriculture, Forestry and Fisheries’ 1999 “100 Japanese Terraced Rice Fields,” and during late April to June, the combination of fishing boat lights and the water-filled fields are especially beautiful. Every year, cameramen come from across the country to capture images of this scene. The squid fishing boats that appear in great numbers during mid-May offer a wonderful photo opportunity as they glisten at sunset. The scene here is of course just as beautiful during the daytime. You’ll be sure to have gorgeous photos to upload. On Saturday nights, when the weather is bad, there will be few fish, so there will be fewer fishing lights. Fishing lights will begin to grow in number in mid-May. Senjojiki is a scenic, photographic spot with a beautiful contrast of fresh green and the blue of the sea. 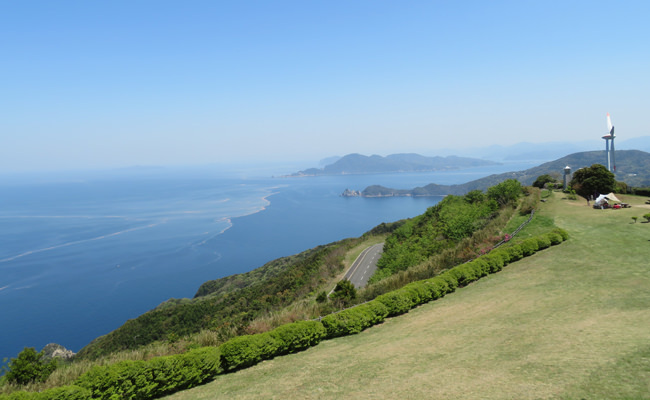 At an elevation 333 m above sea level, there’s a panoramic view of the Kita-Nagato Kaigan Quasi-National Park from Senjojiki. At the observatory at its top, there’s also a café called Country Kitchen. Come stop by to take a break. On your way back from Senjojiki, you’ll find Sugamuta Park close by the windmills. 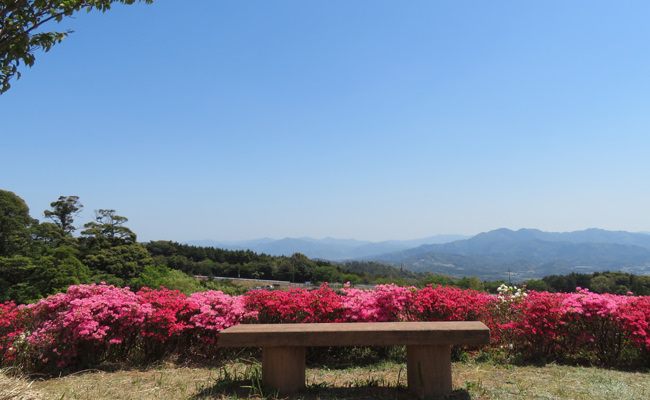 On previous years, just during the Golden Week holidays, some 18,000 rhododendrons bloom here. We recommend catching a shot of the windmills and azaleas together. The park is also visited by honey bees, and visitors can truly enjoy the best of spring flowers. 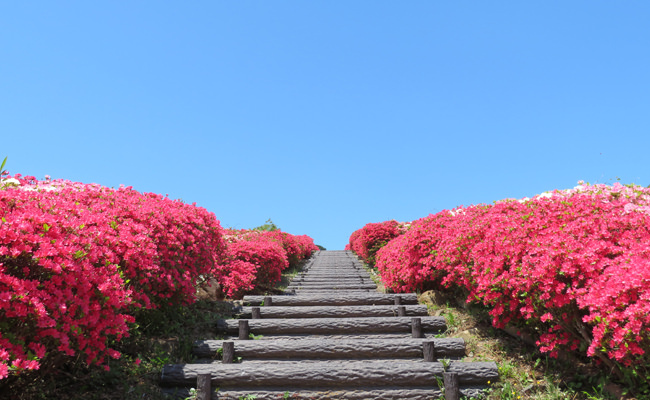 2: Around Golden Week, azaleas grow thickly around the central stairs here, making them almost like a stairway to heaven. Within the park, a path has also been constructed for visitors to stroll around its expanse. Why not take a leisurely stroll? 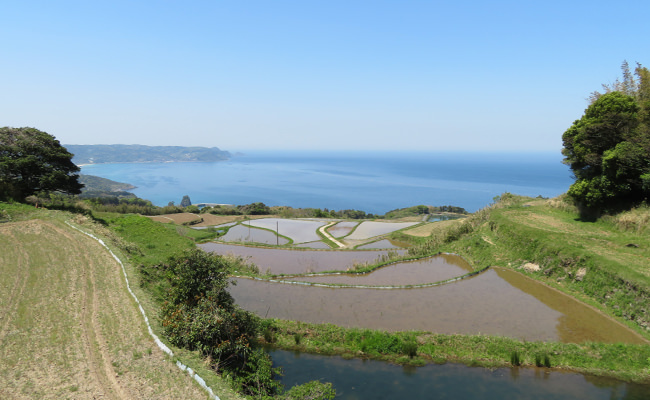 3: The view seen from the crest of the hill is a panorama that looks out across the mountains of Nagato. 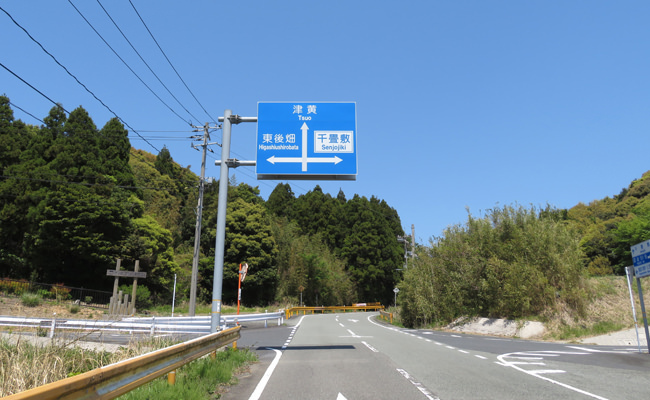 Around Golden Week, the colors of the azaleas bring out the brilliant blue of the sky and the green of the mountains even more.